Rogue Beer has created a special series of bottles for The Oregon Coast Aquarium and the Three Arch Rock, the U.S. Department of Fish and Wildlife refuge. A portion of the proceeds goes to the programs. The Rogue Foundation donated $5,000 to Oregon Coast Aquarium and $1,500 to Three Arch Rock, the U.S. Department of Fish and Wildlife refuge, on Monday, Dec. 10 at the Brewer's on the Bay in South Beach. Rogue created a special series of bottles for both organizations and a portion of the proceeds goes to the programs. The aquarium series includes: Sea Otter beer, spiny lump sucker T-shirts, Wolf Eel Ale, and Shark Tooth Ale. Three Arch Refuge has a specialty beer, the Puffin Pale Ale, which also provides the history of the refuge that was established during Theodore Roosevelt's presidency due to encouragement from conservationists William L. Finley and Herman Bohlman. Roy W. Lowe, Project Leader for the U.S. Fish & Wildlife Service Oregon Coast NWR Complex, said, "We're very appreciative that this gets the message out on the refuge," and he added the grant monies will help fund education programs for the refuge. Dale Schmidt, president and CEO of Oregon Coast Aquarium, said through their partnership with Rogue over the years, the aquarium has received $17,000 which helps fund the new, changing exhibits. 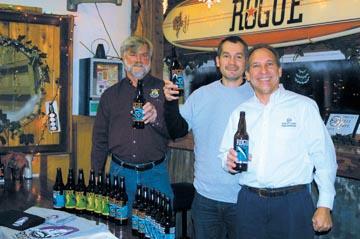 Brett Joyce, president of Rogue, stated the products will be sold at various retail stores across Oregon. As winter approaches it is important to prepare you pond for this seasonal change in conditions (depending on your climate zone). In the warmer western areas of Oregon ice is not an issue as much as in the higher elevations of Eastern Oregon. However leaves that have accumulated from the many deciduous trees that grow in many of the western valleys are a problem. 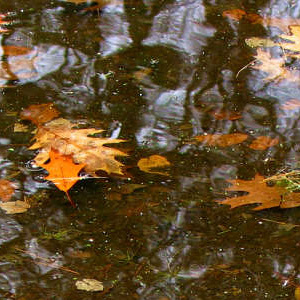 Leaves that fall to the bottom of the pond decompose adding to ammonia, lowering ph and KH to dangerous levels and sometimes releasing toxic Hydrogen Sulfide. The pond keeper needs to either cover the pond with netting or remove leaves before winter sets in. Also as temperatures fall below 60 F (15 C) in the pond I feed every other day or less, depending on fish feeding habits. Below 50 F (10 C), I do not generally feed as fish become much less active as their metabolism slows down. It should also be noted that the protein content of the food should decrease as well while wheat and wheat germ content increase. In regions where icing will occur it is important in winter to keep at least a small section of your pond open for proper exchange of gasses (O2, CO2), if water can still flow into the pond through a water or aeration device, that will work. A minimum depth of 24” will provide enough water space under the ice for fish to hibernate. An aeration device or pump placed about midway from the surface/bottom that circulates upward generally will keep an area of the pond surface free of ice and allow proper gas exchange. In deep ponds over 5-6 feet (1.75 -2 meters), thermal layering, called thermoclines, may exist. This acts as sort of an “inversion layer” similar to how smog gets trapped in the air in Los Angeles. This traps CO2 and Hydrogen Sulfide near the bottom which is dangerous to fish and in this case you need to add water pumps or aeration devices at the bottom.